Mindful they have been created in the image of the beloved Son of God, the friars are to praise the Father, the Son and the Holy Spirit along with all their creatures; they are to restore all good things to the Lord God Most High and give thanks for everything. They are to exalt and celebrate with renewed JOY each day the love which the Father, “who created us and redeemed us and will save us by his mercy alone”, has for the world and for us. 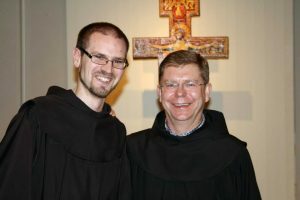 Get to know more about the Franciscans by reading a life of St. Francis of Assisi and /or continue to check out our website for recent updates.